Beautifully presented four double bedroom semi detached house with a spectacular 160 ft landscaped rear garden. Extensively modernised throughout, a large dual aspect living room, separate dining room and kitchen/breakfast room, plentiful off road parking. Convenient for access to the town centre and Ringwood academy school. SUMMARY A beautifully presented extended four double bedroom semi detached house offering deceptively spacious and well planned accommodation, that has been extensively updated and tastefully redecorated during the present owners occupancy, and includes a large dual aspect living room, separate dining room and a kitchen/breakfast room with shaker style kitchen units with various integrated appliances. The house benefits from full gas fired central heating and replacement Upvc framed double glazed windows and external doors throughout. A stand out feature of this property is the quite spectacular 160 ft landscaped rear garden. SITUATION Hightown is on the outskirts of the historic market town of Ringwood. Within this area there are country style Inns, including the nearby 18th Century Elm Tree, not to mention the draw of the Ringwood’s diverse culinary choice cafes and pubs. The popular co-educational school, Moyles Court is only a short drive away and the well reputed Ringwood Academy is within level walking distance. The A31 is close by linking directly with the A338 for Bournemouth and the cathedral city of Salisbury, and also the M27 for Southampton and Winchester. National Express offers frequent coach services from the town centre linking Ringwood with London and its airports. ACCOMMODATION An enclosed front entrance porch with composite double glazed front entrance door, Upvc double glazed side panel windows and an opaque polycarbonate roof, oak flooring, leads directly into the entrance vestibule, high wall mounted Hager consumer unit, staircase with hand rail rises straight ahead to the first floor landing, oak finished panelled doors lead to the dining room and also the living room; a large dual aspect room, polished stone fire surround and raised heath, fitted coal/flame effect gas fire, engineered oak plank flooring, double glazed patio doors lead directly into the conservatory with a lovely view of the rear garden, substantially built on a cavity brick picket wall with Upvc framed double glazed windows and roof panels, double glazed French doors lead onto the patio area. The aforementioned dining room has a front aspect, with solid oak flooring, understairs storage cupboard and a wall mounted rotary thermostatic control for the central heating, an oak framed opaque glazed door leads into the large kitchen/breakfast room; square edged oak effect laminated work surfaces with inset Neff four ring stainless steel finish gas hob and chimney style extractor above, some glazed back stands, a comprehensive range of’ ‘shaker style’ cupboard and drawer units beneath the work surfaces, two electric kick heaters are built into the plinths, matching wall hung kitchen cupboards and pelmets with concealed lighting, three matching tall cupboards, with one housing the Alpha 18 cdr gas fired central heating/domestic hot water boiler, the acrylic one and a half bowl sink unit is positioned beneath the rear kitchen window to take full advantage of the glorious garden view, further integrated appliances include a Neff fan assisted electric oven and a Bosch dishwasher, there is space/plumbing for a washing machine and also space for a double fridge/freezer, space for an under mounted fridge. Within the kitchen there is plenty of space for a breakfast table and chairs, a double glazed rear door provides access to the rear patio and garden, tile effect vinyl floor covering flows into a rear vestibule area with a fitted double airing cupboard which has slatted shelves and houses the factory lagged hot water cylinder/immersion heater, oak finished panelled door leads to the shower room; corner glazed shower cubicle with three quarter height tiling and thermostatic shower valve, low flush wc and vanity unit with integrally lit mirror above both with tiled surrounds, Ventaxia extractor fan. The first floor landing has doors to all four double bedrooms and the bathroom. Bedroom one has a front aspect with wall to wall sliding mirror fronted wardrobes. Bedroom two is also located at the front of the property; fitted double wardrobe with opaque glazed sliding doors, adjacent to which there is a fitted corner dressing table, wall hung book shelf and display shelf, deep over stairs shelved storage cupboard. 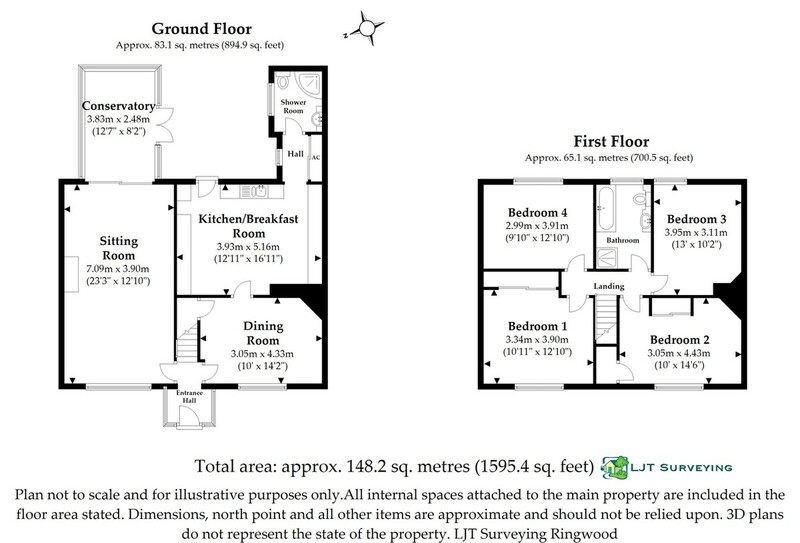 Bedrooms three and four are located at the rear of the property and enjoy glorious garden aspects, the latter is currently used as a good sized office/study with access to the loft. The bathroom is fully tiled with a white suite comprising; panelled bath, corner shower cubicle with a fitted Mira Sport electric shower, vanity unit with a corian moulded basin and shelf, Bristan Mixer tap, low flush wc beneath the shelf with concealed cistern, wall hung internally lit mirror and a heated towel rail. EXTERNALLY The property enjoys a wide frontage defined by ranch style fencing and mature hedging. The front garden area is mainly laid to blockwork paving providing plentiful off road parking, a side gate to the left of the house leads via a paved pathway into the rear garden which extends to approximately 160 ft with south and east aspects. A concreted apron and patio wraps around the conservatory with direct access onto the patio also from the kitchen/breakfast room, in this area there is an external water tap and is sited a timber garden shed with double doors, which then leads onto a beautifully manicured and visually stunning rear garden which is laid to a series shaped lawns bounded by a colourful array of herbaceous varieties, ground cover shrubs and ornamental trees all of which creates a spectacular display, and also provides high degree of seclusion. At the bottom of the garden a pergola leads into an enclosed vegetable garden with timber edged raised beds, aluminium framed greenhouse and a large colour washed timber garden shed/storage facility.